We sell Ecoleaf - Suma products like Ecoleaf Dishwasher Tablets - 70 tablets online in the UK and directly from our award-winning store in Scotland. These dishwasher tablets are made using ingredients derived from plant extracts from sustainable sources, they're natural, biodegradable, and safer for the environment. For all those hands that don't do dishes, give our new eco-friendly dishwasher tablets a try. Made using ingredients derived from plant extracts from sustainable sources, they're natural, biodegradable, and safer for the environment. A built in rinse aid, degreasing action, and powerful cleaning agents will leave your glasses and dishes sparkling. The inner film coating dissolves in your dishwasher and the outer cardboard packaging is also recyclable. Swap to our new tablets today! We sell real Ecoleaf - Suma and other Cleaning & Laundry directly from our shop in Scotland and online throughout the UK. View more products from Ecoleaf - Suma. Where can you buy real Dishwasher Tablets 70's safely online? 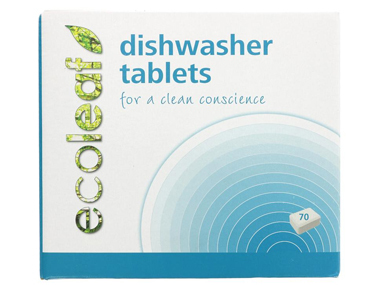 If you are wondering where you can buy Ecoleaf Dishwasher Tablets - 70 tablets safely online in the UK, then shop with us. Dishwasher Tablets 70's - Ecoleaf Dishwasher Tablets - 70 tablets in Cleaning & Laundry and Household.